The best lavender for cooking. Also makes wonderful lavender tea! You can add some lavender to a small muslin bag which you put in your dryer so your linens have a wonderful aroma and you have a peaceful night's sleep. It is also great when a headache strikes. Wonderful for herbal baths, dream pillows, sachets and many other crafts. If you receive defective items or meet any other problems, please contact us, we will give you a satisfactory reply within 24 hours. 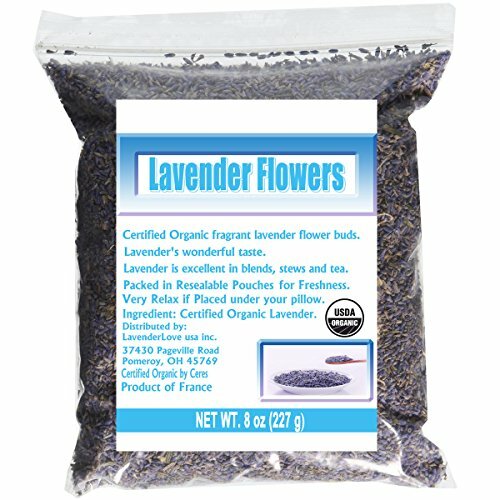 USDA ORGANIC LAVENDER: Light purple, pure and nature, Certified Organic by CERES. FRENCH LAVENDER FLOWER: Dried lavender imported from the provence region of France. CULINARY LAVENDER: Lavender food grade enhances your favorite recipes from soups to desserts. HEALTH BENEFITS: Relax body and mind by adding a dose of lavender into your day. Fill the air with an aromatic potpourri or gift craft sachets to your friends and family. MONEY BACK GUARANTEE: If you are not 100% satisfied with our Lavender Flowers for any reason, please email us, we'll give your full refund or replacement. If you have any questions about this product by CCnature, contact us by completing and submitting the form below. If you are looking for a specif part number, please include it with your message.